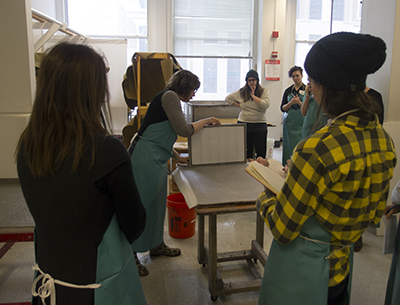 Students in the January 17-18 Papermaking workshop at CBPA arrived at the studio early, and would have stayed late, if only the building hours were longer during J-Session! 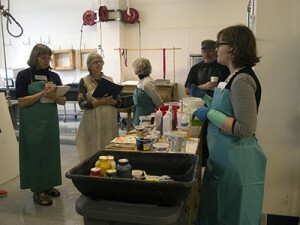 Papermakers of varying experience and from far and wide joined guest artist Amy Jacobs to tackle the delicate techniques required for successful pulp painting. 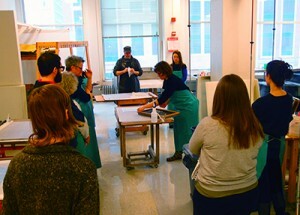 With four different types of fiber and a rainbow of pigmented pulps, workshop participants wasted no time in creating a wide variety of large, small, and shaped sheets. “It’s important for new users of pigmented pulp to try out the combinations of fiber and pigment, to develop a feel for how the chemistry works, and what measurements will give them the best results for their own artwork,” said instructor Amy Jacobs. Amy, an alumna of the Interdisciplinary Book and Paper Arts program, is the Studio Collaborator and Education Manager at Dieu Donné Papermill in New York City. 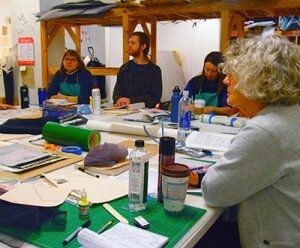 For the first 45 minutes of each day, she demonstrated stenciling, watermarks, blowouts, and pigmenting pulp in quick succession, and then set the students loose in the studio space to work on as many of their ideas as possible. As she rotated around to answer questions and troubleshoot, assistance in pressing and beating more pulp was provided by graduate assistant Kathi Beste, allowing workshop participants to create their work without interruption. For more information on Amy’s work at Dieu Donné Papermill, click here. For information on upcoming community workshops at CBPA, click here.